International news: Growth Mindset for Mentors toolkit now available. Earlybird registrations are now open for Involve 2018! Register before 7th May and get early bird discounts up to $100. Click on the pic to for more information. Involve is the largest national youth development conference in Aotearoa - it provides a space where the youth sector can come together to connect, share, learn, grow and celebrate our diversity and strengths. http://bit.ly/Involve2018, the Facebook Event and general social media! Its not to late to submit an application to present at Involve 2018. These are due next Wednesday 28 February. We'd love to hear from you if you've got a piece of learning or research, a framework or tool or reflection to share from your strengths based and rights based work with young people! Au ckland MentorPlus course, 22nd /23rd May - Register now! "The workshop is really practical. It taught me how to talk with our mentees more effectively and ask the right questions." "It gave me really useful activities that we can use with our mentees." 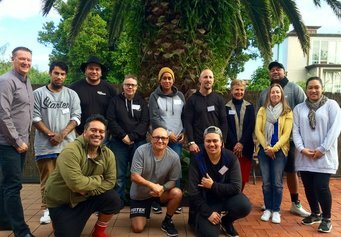 "I really enjoyed sharing korero with workmates and looking at the theory behind how we work with young people." The Centre for Community Research and Evaluation - Pūtahi Rangahau Ngātahi at the University of Auckland is hosting a practitioners’ workshop on the Theory of Change. The step-by-step and interactive demonstration of the process is designed to enable participants to leave feeling confident that they can implement the approach within their own organisations. Please feel free to print and share the attached flyer with your colleagues. The Conversations for Change resource has been created by Mind and Body Consultants, as part of the Like Minds, Like Mine programme which is managed by the Health Promotions Agency (HPA). It is designed to reduce stigma and discrimination connected to mental distress and to increase social inclusion. It contains comprehensive facilitator's guides to five group activities which challenge stigma and discrimination, and generate safe conversations about mental distress. The resource aims to encourage young people to reach out for support, and to include and support each other. The activities are creative, lively, and easy to implement. MENTOR (USA) has released the beta version of the Growth Mindset for Mentors Toolkit, developed in coordination with Stanford University’s PERTS Lab and City Year. This online resource shows mentors how to guide their mentees in developing perseverance, self-reflection, and positive decision-making. The Raikes Foundation supported this initiative to help create an online resource that applies the principles of Growth Mindset to mentoring relationships and shows mentors how to guide their mentees in developing perseverance, self-reflection, and positive decision-making by cultivating a growth mindset.